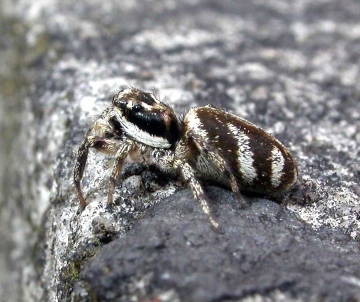 The Zebra Spider Salticus scenicus is a species of jumping spider (Salticidae) that is common and widespread in the southern half of Britain. It can be easily recognized in the field by the black and white stripy pattern of its body: abdomen usually black, with its anterior margin white and dorsally with 2 white stripes running toward the middle. Males usually have long and very pronounced brown chelicerae. As with all jumping spiders, the Zebra Spider has excellent binocular vision and it can jump, either while pouncing on its prey or when escaping its own enemies. The species can usually be observed on sunny walls of the buildings, in gardens and on rocks; it sometimes occurs on tree bark. The Zebra Spider can be misidentified with another British species of jumping spider Salticus cingulatus. The latter usually has a white abdomen with two pairs of conspicuous triangle black spots on its dorsum. Besides, it usually occurs on tree bark, and it is very unlikely to be found in gardens. Both species can be easily distinguished by their copulatory organs (see Spiders of Europe; online at: Spiders of Europe ; additional information and images of both species can be found on this website at: Salticus scenicus and Salticus cingulatus.